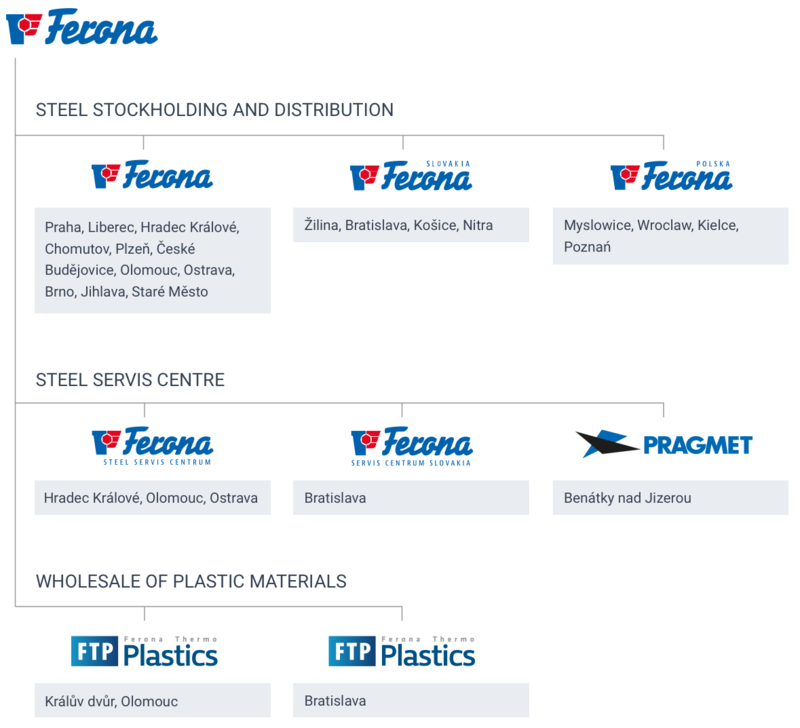 About the company | FERONA a.s.
Ferona, a.s. is a modern company involved in the wholesale purchase, storage, processing, logistics, and sale of metallurgical products, metallurgical secondary products, hardware, and non-ferrous metals. Ferona, a.s. does business in the Czech Republic, Slovakia, and Poland. Our company includes Pragmet, a.s., which focuses on the automotive industry. Another company is FTP, which focuses on plastic and composite/hybrid materials. We aren't just a narrowly-focused metallurgical distributor; we have become the focus of materials engineering for Central Europe. Our branches and warehouses cover the entire Czech Republic, which allows us to maintain direct contact with customers, large or small. An unmatched range of goods and comprehensive services such as transport (we have a fleet of over 100 trucks), material cutting and processing (our Steel Service Centres cut over 350,000 tonnes of material annually), retail outlets, and our own certified test laboratory for material quality verification and monitoring. Thanks to investments in ITC technologies, we are prepared to become your partner even in the event of Industry 4.0 requirements. Ferona's aim is for its goods and services to satisfy everyone who decides to do business with us. Registered in the Commercial Register kept by the Prague Municipal Court, Section B , insert 7143. The company was originally founded as Rekulus, a.s., by a group of shareholders, acting in concert, of the then Ferona, a.s. (ID No 25 79 20 75). As of 1 April 2001 pursuant to § 220p of the Commercial Code, Ferona, a.s. (ID 25 79 20 75) took over the company as its main shareholder, based on a takeover agreement approved by general meetings of both companies on 27 June 2001. The takeover entry in the Commercial Register came into legal force on 29 August 2001. Based on a merger agreement, the company, as the successor, took over the assets of the dissolved controlling company, STEEL INVESTMENTS GROUP, a.s., as of 1 January 2005.